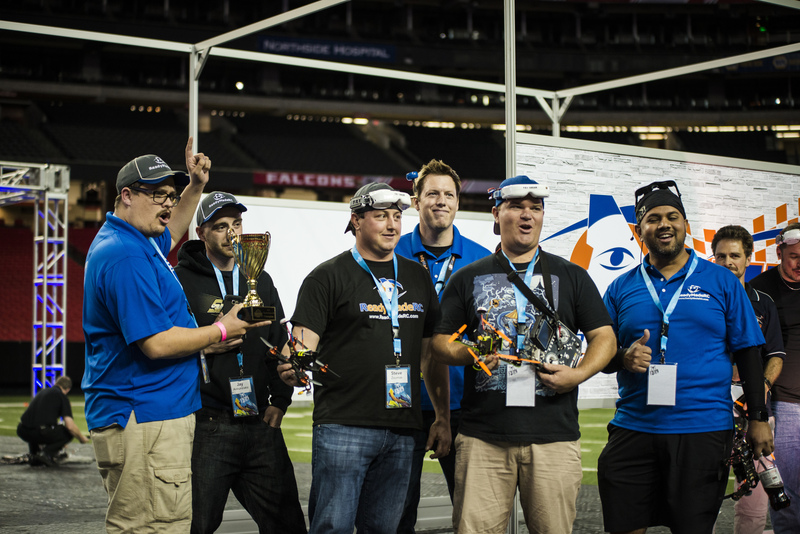 The Ready Made RC team that won the first ever ThunderDrone500 endurance race. This past weekend at the F3 Expo in Atlanta, Georgia, ran the first attempt at a brand new type of FPV (first person view) racing for rotor-sports (drone racing) called the “ThunderDrone500.” The Thunder Drone event is a brand new take on roto-cross and drone racing. Rather than placing the focus of racing on individual performance, endurance races levels the playing field by making it a team sport, with a multitude of different roles and responsibilities for each team member. As a result, it takes the individual competition of roto-cross and creates a brand new team sport, further padding the endless possibilities of FPV racing. Interview with A.J. Goin, team pilot for RMRC and member of the winning ThunderDrone500 team. The rules of NASQuad are yet undefined, but we can look at the successful version that was run at the F3 Expo. Essentially, it’s a relay race. As it currently stands, teams consist of 7 people, but this could be adjusted to suit the needs of any event. Teams consist of 5 pilots and 2 pit crew. The “lap” will be fairly simple — the course design is NOT to cause slow downs and crashes, but instead to provide the opportunity for pilots to run quick, long, laps. In my time with awkBOTS, we considered that a course should be at least a little bit more intense than a NASCAR-inspired oval, so as to make the experience more engaging for the pilots, but not so intense as to cause many crashes. Why is NASQuad “the next big thing” for FPV racing? There are a number of aspects of NASQuad that I think are going to drive it to becoming a major event in the FPV racing community. It offers some unique traits that are far different than that of individual racing and freestyle events. One of the greatest differences between NASQuad and all other types of FPV racing is that by default, it requires teamwork. Since you, as a pilot are dependent on your pit crew and other teammates to fly while you are swapping batteries and preparing for your next laps, it is impossible for you to compete in this alone. In this sense, NASQuad is entirely dependent on being a team-based sport. Members of a given team can specialize into different roles — pit crew members, pilots, and spotters/organizers (a “coach”) are all valid and useful roles in this style of event. When working as a team, rather than as an individual performer in other types of racing, you as a team are looking forward to the end goal. What I find when I’m racing as an individual is that I’m constantly battling against disaster. The focus of my racing is not on “how can I do as best I can with what I have” but instead “what can I do to avoid a massive error that’s going to put me out for the rest of the race?” Working with a team changes the default mentality: instead of constantly fearing disaster, you as a team are pushing each other and focusing on the goal: winning the race. Bumps caused by technical failure are smoothed out because you have a team on which to rely. Simply being on a team and working with others changes this default mentality because there’s now a safety net — you can focus on the goal rather than the path to get there. 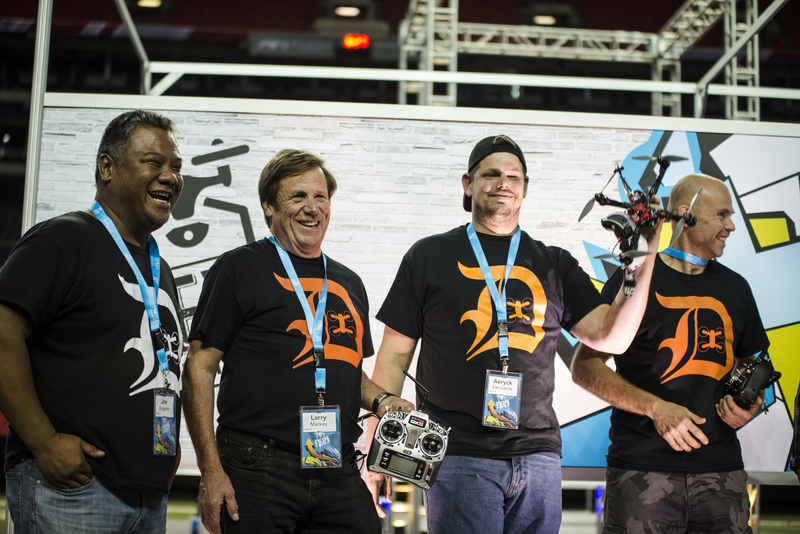 Members of team Detroit Multirotor, Runners up to the ThunderDrone500 race. Another aspect NASQuad that is impacted positively by teamwork is practice and whole-team mentality. By having accountability and people to work with, you as a team will get out and practice transitions, think together to design new, more powerful quads, and be more willing to travel with one another to further distances to compete in these events. 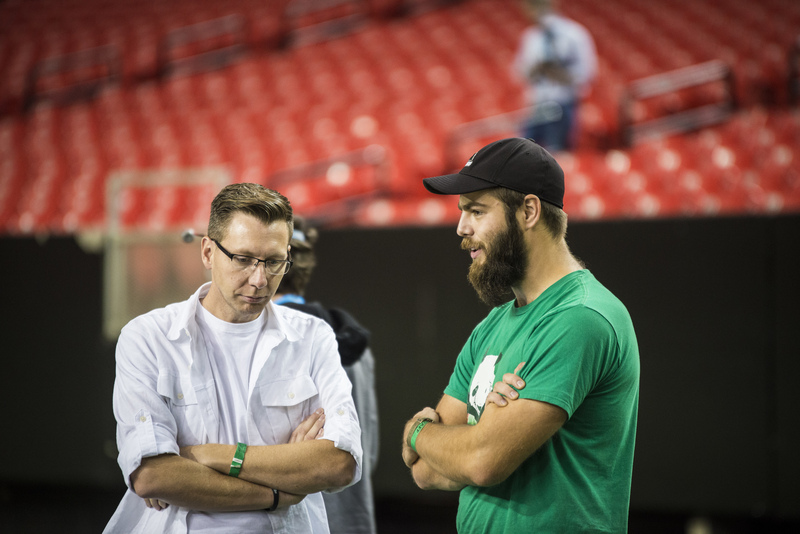 Teamwork bleeds into all aspects of FPV competition. The next important aspect that will drive NASQuad to success is the wild opportunity for innovation and strategy to run rampant through the fledgling event. Even in the first ThunderDrone500, teams were already scheming new ways to fly their machines, make fast transitions, and get quads back in the air as fast as possible. For example, Detroit Multirotor Company (http://www.detroitmultirotor.com/) built custom frames out of carbon fiber just for the event. These specialized quads flew with 7” props, carried 5000mAh batteries, and allowed them to fly all 100 laps only having used 3 batteries. While they placed second, it certainly has already pushed the envelope in terms of design focused on one specific event. This sort of forward thinking is what has driven the hobby of FPV drone racing from its infancy to a worldwide spotlight: hobbyists finding new and creative ways to use the equipment at their disposal to achieve something amazing. This is the exact sort of process that’s already started happening with NASQuad: where will it go next? Beyond the technology and the airframes that are used for NASQuad, there is also immense opportunity for strategy and process to improve. In the 5 hours that team Ready Made RC was practicing for the event, they noticed that one of their biggest delays getting from the mat to the air was that, when they plugged in the quad, it would take 5-10 seconds for the quad to be ready to arm. Teams cannot have two quads powered on at the same time, because it’s possible that the video signal from the quad on the ground would interfere with the signal of the quad hurtling through the air. Obviously, the airborne pilot still needs to be able to see, so they had a problem they needed to solve. This isn’t normally an issue in FPV racing, because you’re not normally trying to get back in the air as soon as possible. However, 5-10 seconds was an unacceptable amount of time for team RMRC, since at the end of a race it can add up to over a minute of time wasted on the ground — in the ThunderDrone event, this would come out to 4-5 entire laps! Thus, team RMRC discovered that they can have two quads powered on at the same time if they unplug the video transmitter of the landlocked quad. Then, when the airborne quad lands, they can plug the video transmitter back in and take off immediately, because the quad will already be armed and revved up to go. 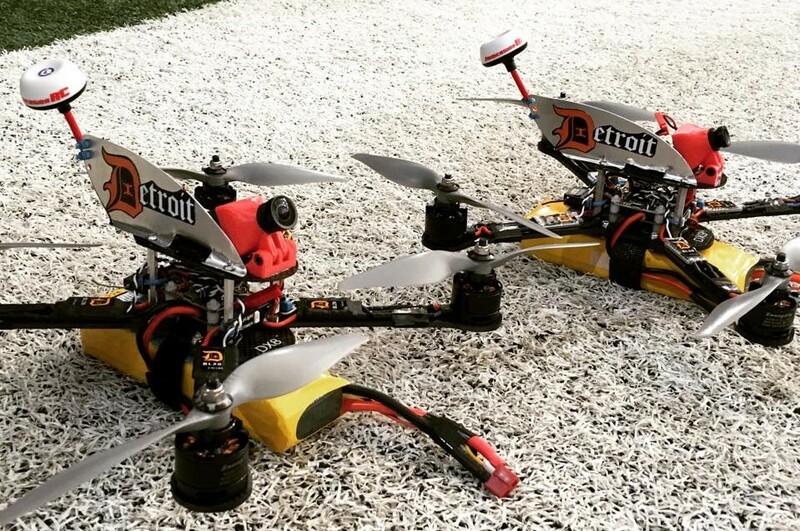 Another quick innovation was from Detroit Multirotor Company. They found that one of the biggest things wasting time was that it took a long time for quads to land. Because they would have to slow down to come in for a landing, they wasted valuable seconds in transition. Their solution? Controlled crashing. They came in for a “landing” by flying full speed into a pop-up soccer net placed on the ground with LEDs along the side. Detroit Multirotor Company crashes into a net to help quickly stop their quad for pit transitions. Finally, along with multirotors, I believe that this style of event will be easily applied to other parts of the FPV community. I see there being a very promising future for this in fixed wing events. A good example would be fixed wing pylon racing, but over a longer distance with FPV gear. The transition area would become even more interesting because planes don’t hover — they have to come in for a landing, so now you add this extra bit trickiness to organizing your team and piloting your craft. The better and faster you land, the quicker your transition will be. Simple innovations like this are going to drive the sport from a first time attempt at an event to one of the biggest parts of FPV racing. The next aspect of NASQuad is that, in my opinion, it makes an even better spectator sport than traditional FPV racing. When the buzzer sounds, 5-6 quads immediately take off, and there will be 3-5 quads in the air for the next 20 minutes buzzing around your head. Standing near the “pitting” area where the quadcopter transitions are happening is immensely exciting. So much drama happens in that small space in a very short amount of time. When quads don’t arm, miscommunication ensues, and near-collisions occur over and over and over again, it’s hard not to be riveted by the amount of tightly packed excitement. As a spectator, you have the opportunity to take your own equipment and tune in to the video frequency of any given team, so that you can watch their progress around the course when not watching quad-swaps. At this particular event, the technology even supported having all 5 video frequencies displayed on the stadium jumbotrons side by side. Being able to hear and watch the quads buzz overhead, see the intensity of the pit area, and watch all video frequencies simultaneously made for a very exciting 20 minute race, the excitement of which (for me as a spectator) is yet unmatched by traditional FPV racing. Finally, I believe that the last driving force for NASQuad will come from money and technology being poured into the sport. In traditional FPV racing, team pilots do exist, and money and parts do come to them to help them compete in an event. However, at the end of the day, it’s one pilot versus another — it comes down to that pilots’ ability to beat all other pilots — most victory is based on the pilot’s ability to win. Contrary to this, with NASQuad events, teams are competing on organization and efficiency. When a company is building a team of pilots for an event, they are betting that their technology will be better, that they are better organized, and that they are there to directly win against other companies. Rather than glory going directly to the pilot that they have employed, the glory is going to organizational efficiency and technology, both of which reflect directly back on the company, rather than the pilots. That’s not to say that members of a team aren’t important, and that good piloting isn’t required, but instead this event just has a slightly different focus than traditional racing. As such, companies are going to be more interested in betting larger amounts of money on team-based FPV racing events because they are ultimately in control of their own destiny. They will have a larger impact on how well teams do than with individual racing, and they will be able to push their technology as the best as a result. To take it a step further, because these vendors are traveling for events, they are going to bring gear and branding, and they’re working together to earn the opportunity to win an event, putting them in the limelight as the company that won an event, rather than a pilot that won an event. In doing so, they have generated more interest and more money than they shelled out just to participate. Your author, Paul Nurkkala gloats at a downed quad. One of the things that is potentially standing in the way of NASQuad taking off are safety concerns. While no accidents occurred at the ThunderDrone500 event, I think it was a lucky fluke. For the pit crew, you are responsible for your two quads, but you also have 5 other teams coming in and landing all around you, so it’s very likely that an accident could occur simply because you don’t have enough attention span to focus on 10-12 different quads that could all potentially come to life and chop your fingers off at any given moment. We need to reconsider how we have the pit crews set up — what kinds of safety gear can they wear to prevent accidents involving props? How can we lay out the pitting area in such a way as to prevent accidental collisions with pit crew members? Another concern is the technology itself. Multis and their batteries are generally not rated or designed to be run at 90-100% full throttle at all time. By pushing the batteries and the electronics to their limits, we are increasing the likelihood that there will be a motor/esc failure or a lipo fire, both of which lead to quads plummeting out of the sky, potentially injuring someone. Technology design needs to improve to help design quads that are aimed at running long distances and high heat for long amounts of time. In the meantime, we need to design courses and implement safety features to mitigate any potential disasters. 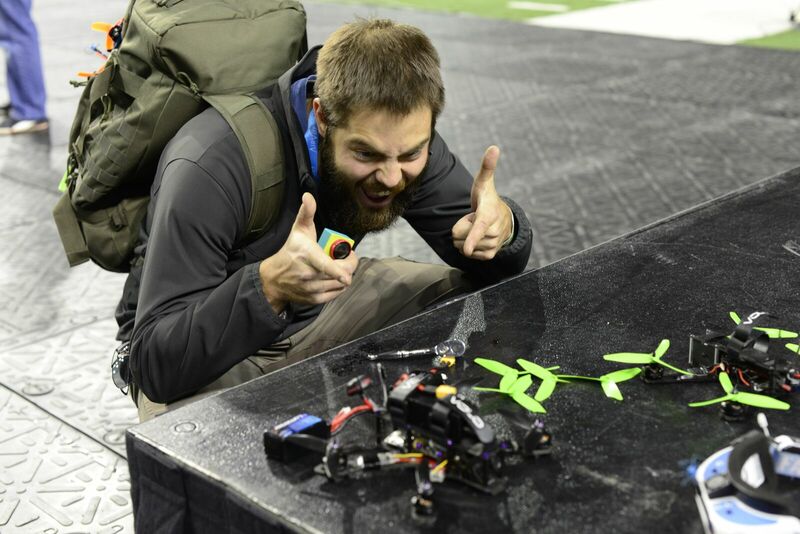 The ThunderDrone500 event was an unmitigated success, and it has opened up the Pandora’s box that is RC innovation on a whole new world of possibilities for FPV racing. By pursuing teamwork first, we drive for success, not run from disaster. As a new area of possibilities, innovation is going to drive NASQuad to bigger and better machines and courses and events. Much like automobile racing, the technology and pit-stop process is a huge element of the race, as it is here. While the race should be engaging and exciting for the pilots, this will also be driven by the fact that it’s fun to watch as a mere spectator, and not just compete in as a pilot. Finally, with vendors pitting themselves directly against one another, more capital will be flowing into the hobby than ever before. NASQuad is on the rise, and it’s going to become to continue to drive FPV racing into the limelight. Paul Nurkkala has been flying FPV for about 9 months, but been interested in RC for his entire life. While the piloting and racing is fun, he is very excited about the community and content that surrounds the fledgling sport. Moreover, he firmly believes that FPV piloting, freestyle, and racing is a true and pure form of self-expression. Who you are is exhibited by your piloting, driving FPV beyond a simple hobby and into a way of life.